This is a collection of songs I did last year. I chose songs with my favorite singers and musicians. Thanks to everybody involved who made such a great contribution! "thnx to all loopers! and hail to wikiloops in general!" Can't think of a title at the moment... How about Frenzie Rocks! The love for the Blues is what unites us and are happy to listen to different tracks here where we met us . I adore the feeling that you masterfully pull out of your guitar. Enjoy always the Blues my friend! If you like the blues, master of wikiloop blues Mr Frenz has them in all styles with a master touch. Thank you frenzie for your contributions. It's my honor and pleasure to be included in this album. Like Frenzie, the blues were not my prime genre before joining Wikiloops. But, after listening to the incredible guitar talent of "The Blues Man", I thought I would give it a go. The result - three songs on his album! And with such distinguished company! 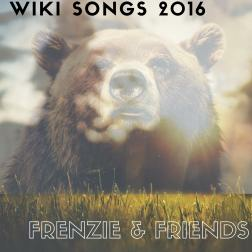 Frenz - thank you for you music, for you support, and for your friendship. I look forward to jammin' with you some more in 2017!